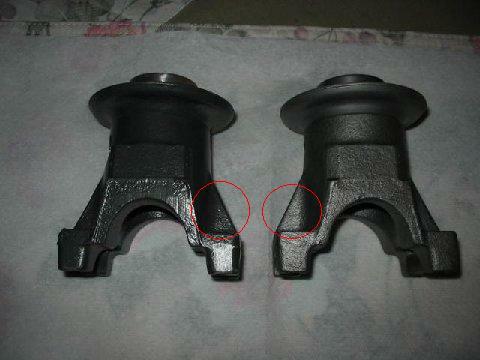 Ford identified the rear u-joint flange (also called a pinion yoke) used behind 428 CJ and SCJ engines using basic part number 4851. The 1975 Master Parts Catalog identifies the flange using service part number C4AZ-4851-A, which was replaced by D2OZ-4851-A in October, 1973. 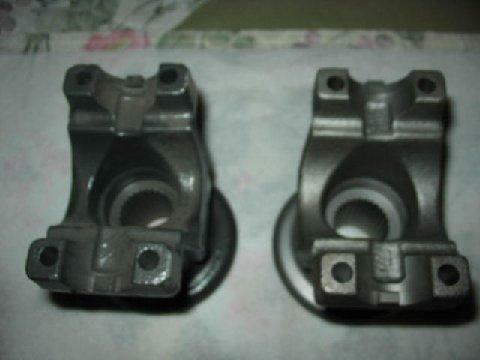 For some period of time before then the part was serviced under part number C9OZ-4851-A. I don't have any information describing the service part number used during the 1968 model year. It was designed for use with a 1330 u-joint. 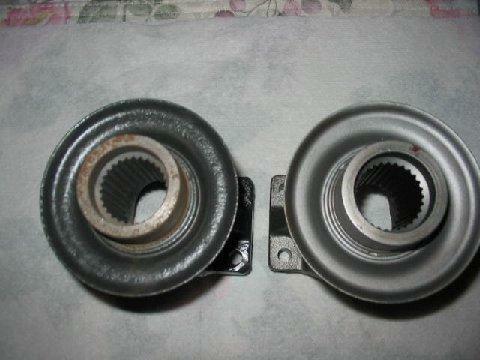 People often describe this part as being used with a heavy duty "Daytona" pinion support. Here are some pictures, courtesy of Lee Harvey. Note that the two flanges pictured are identical. Note that the shape of the part, but not the dimensions, apparently changed over time as Ford introduced new service parts. The MPC includes an ID chart that illustrates the differences. One that I can see is that the C4AZ-A flange is described as not having the supports circled in red above. The D2OZ-A flange apparently does, so I'm assuming that the flanges pictured here are of the D2OZ-A variety. This part isn't unique to the Mustang. 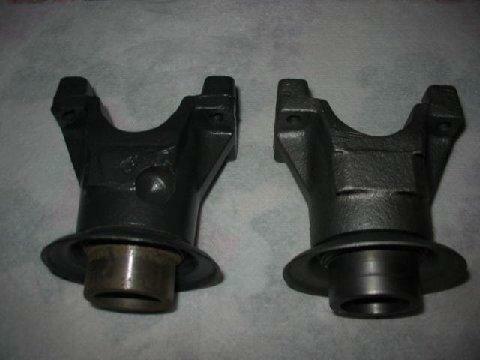 It was also used on other Ford vehicles equipped with 31-spline axles and a 9-inch ring gear. The best way to identify one is by measuring. The overall length is 4 25/32". It measures 3 5/8" wide from ear-to-ear. The most significant measurement is the distance between the nut and bearing surfaces. You're looking for 2 9/64".